After two years of shooting, almost 300 hours of footage, and over 40 interviews, the film ‘Attack Of Life: The Bang Tango Movie’ is nearing completion. Fortier plans on having a rough cut of the film — which also features interviews with with current Joe LeSte fronted line-up of Bang Tango as well as former members Mark Knight, Kyle Kyle, Kyle Stevens and Tigg Ketler — done by late spring and is aiming for an L.A. premiere around July or August. Meanwhile Enuff Z’Nuff will be setting sail on the Monsters of Rock Cruise this week, followed by a tour of the UK in April, before gearing up for a new record. 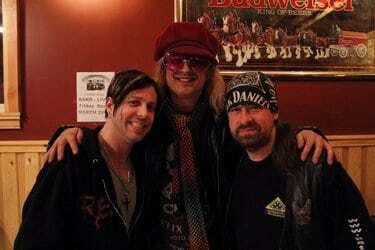 A complete list of Enuff Z’Nuff tour dates can be found at www.enuffznuff.com. Trent Anderson and Tuff are also hitting the road, beginning their spring tour on April 24th in Cleveland, Ohio — more information is available at tuffcds.com.